The combination that works wonders; before the addition of the dry chili flakes/paste – A MUST when it comes to Chilly Pan Mee in KL. And I am drained. Weekend just flew by before I could even catch my breath. And it doesn’t help that I was suffering from an extreme case of caffeine-withdrawal this morning. Wait, that took almost half my day away, and I was lying in bed with a throbbing headache and utter frustration that my Sunday’s half gone ……. But of course, the second half of the day was good. But let’s leave that story to another day. If you’re feeling like tormenting yourself, or taking up the challenge to a new level, feel free to gulp down on the dry chili paste. Scoop all you want onto your bowl of pan mee (flat flour noodles), but take heed of this advice; remember to test the waters. You don’t wanna be screaming in agony come the next morning in the loo …..
And I have only tasted Kin Kin’s version of the famed chili pan mee back when they opened a branch in Pandan Indah sometime back in 2008. However, that was a pathetic experience as the noodles tasted bland and the chili paste was too salty instead of rightfully spicy. So when this opportunity to try Super Kitchen‘s version (in Puchong, no less), I had my initial qualms. But was the excursion proven to be worthy or was it a waste of time? Even the soup version of pan mee came with a beautifully poached egg floated on top; combined with lots of minced pork, crunchy anchovies and green leafy goodness of ‘sayur manis’ (sweet leaves). Of course, there are the Cha Cha’s, Bou Bou’s or whatever brand(s) they came up with; jumping on the bandwagon of Kin Kin’s enormous success. ADDICTIVELY delicious. Try 2-3 spoonfuls of the dry chili paste before going all out. Just in case your tastebud is not accustomed to the fiery sensation, and the spiciness killed your senses. 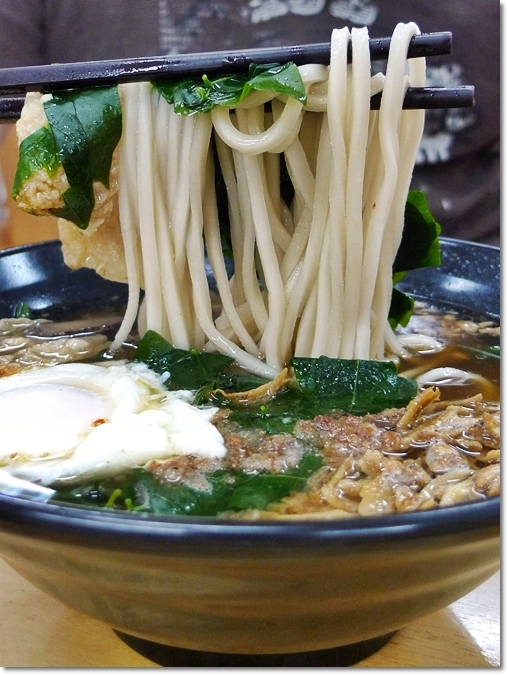 Good noodles with a bouncy texture; just toss them up real good and break the egg into pieces. The moisture from the poached egg will coat the strands of flour noodles (I chose the thinner version, but I forgot whether they had the flatter, chunkier ones), then the savoury flavours from the minced pork and crispy anchovies pulled through. 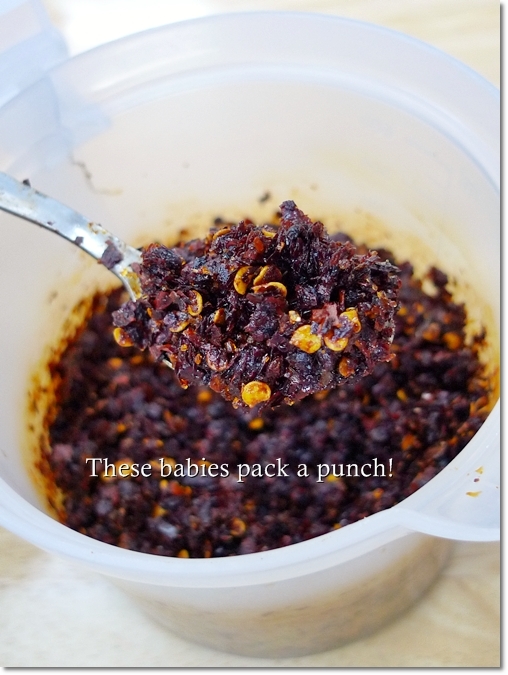 Of course, can’t neglect the pungent, robust kick from the chili paste. Every slurp-ful was a delight, almost a moreish sensation that kept me slurping up the noodles with glee, all the while beads of sweat forming on the forehead. Okay, maybe not. For I went easy on myself that morning; being the first time meeting up a certain Witch and her dedicated significant other. Just in case you’re having trouble the very next day, this roughage will assist. 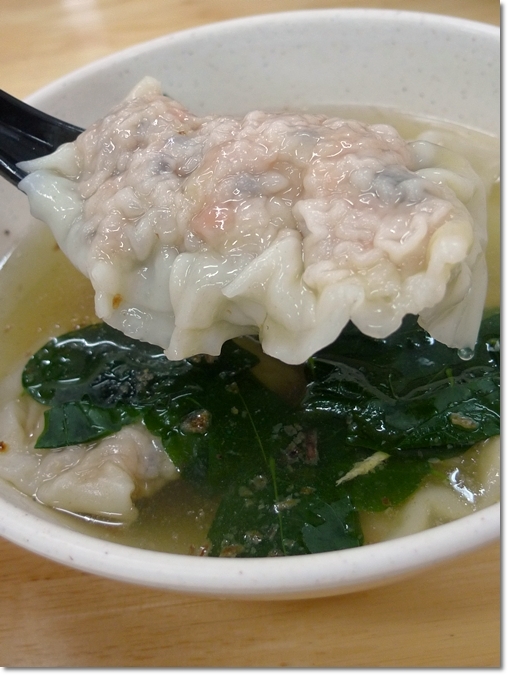 And just so we can linger around longer, we had a small serving of Sui Gao (dumplings in soup) to be shared. Bigger portions, delicious pan mee with a fantastic chili paste, and pleasant service. Zero attitude (maybe, just maybe ’cause I was with them, and the lady boss recognized Witch!) unlike the Jalan TAR’s Kin Kin (still remember how vkeong was breathing fire through nostrils for all the wrong reasons!). 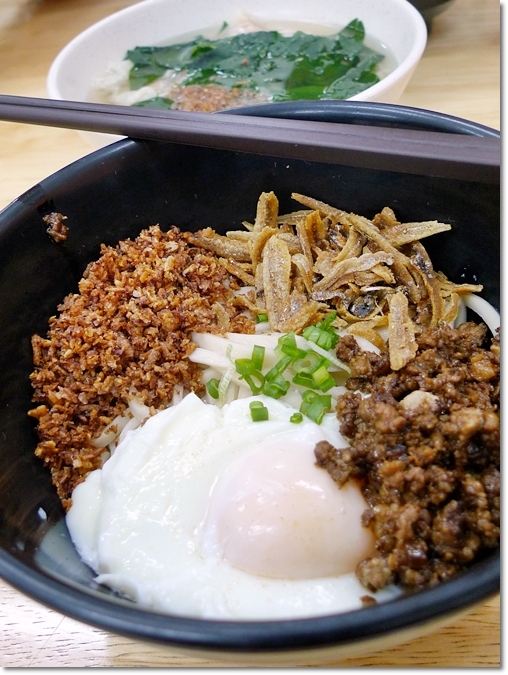 Super Kitchen Chilly Pan Mee – Spicing up your neighbourhood in a delicious manner! 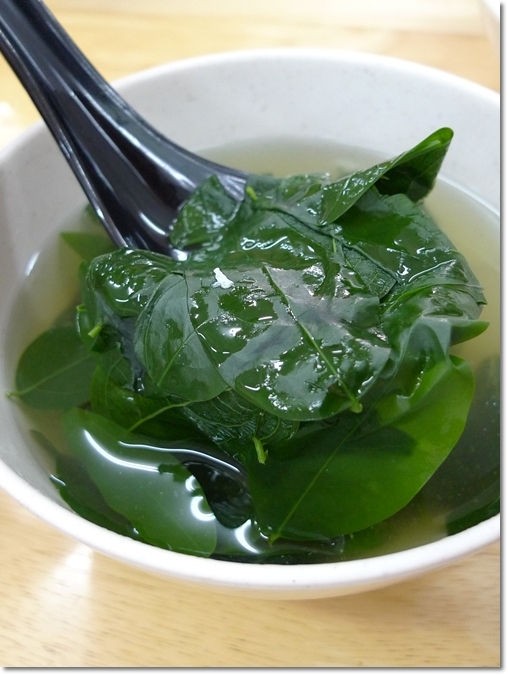 *For more information, please refer to their website – http://www.chillipanmee.com/. They have 6 outlets across Klang Valley, and this one was at Bandar Puteri Puchong. EH I think the one near to tesco Station 18 got this. The other Ma Lat Pan Mee elsewhere is mainly pan mee in a slightly spicy broth. wuzzz, so fast another new post. One thing i like about them – good customer service. I tried Kin Kin once. Never went back. I dont care how good it is, Super Kitchen’s is yummy as well, and I’ll sure as hell support an outlet that has good service. Btw – they hv an outlet opposite Kin Kin @ off Jln TAR as well. And altho i only go when I’m in KL (which is not often), the lady boss seems to remember me anyway (maybe cos I tell her i come all the way fr Pg to eat her pan mee!) hahaha…. Yeah …. somehow, I felt that service was good. Unpretentious and attentive. No attitudes loh, but this one in Puchong not that crowded anyway. LOL. Well, always good to see that there are more pleasant alternatives to Kin Kin. i just had it yesterday !! it’s really yummilicious !!! About 3 spoons I think. Not that bad. Very addictive ler … feels like having the chilly pan mee for lunch today! apparently another one in Dataran Sunway Kota Damansara… tried it before but didn’t like their version. This is my favourite! I will eat this every time I go KL. Can you please bring it to Ipoh, I’m craving for it la! Haha… tapau meh…… when you coming down for CNY shopping eh? Come lah, we go eat pan mee. I am not sure if this is the same one in USJ but don’t go for the curry one. i should have stuck to the original flavor. I jelak for 2 days on the curry >_< but the above looks damn good! They do have several outlets all over. Curry Pan Mee jelak 2 days?!!! wah..sure must be very rich eh? I can sense fire in the hole with 3 spoons of the flakes …. I should have made you put on more! At least until I could see beads of sweats forming on your head.. after all, first impressions are the ones that make a lasting memory and THAT would be a sight to remember! 😛 As high tolerance that I have towards chilli, I don’t know why I still had to go toilet after this noodles 😛 But surely addictive! Puchong ah? The one in Kota Damansara and Chow Yang doesnt seem good to me, hence never bother to go back. Yes ah? Even compared to Kin Kin? Hmm … but the combination at Super Kitchen was good woh. I felt they cooked up a balanced pan mee, so you can perk things up with the chili paste. Unlike Kin Kin which was horrendously salty, and so small in portion. taking the bad services part aside, I still like Kin Kin’s better. the noodles have a little more bounce and the chili paste tastes better, with the addition of lards(!) haha. 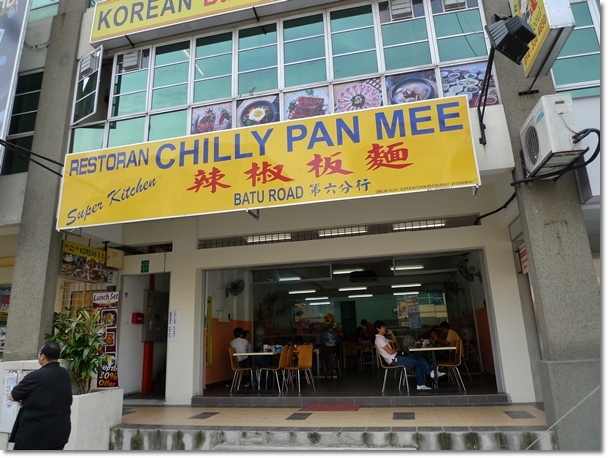 Hi, i already went to bandar puteri branch and tasted their chili pan mee. Not so good already. Standard drop. 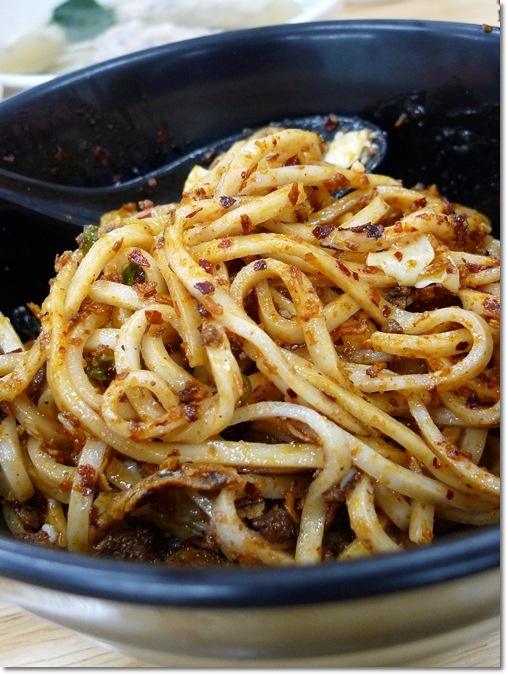 Actually, I just had chili pan mee for lunch yday at the Chow Yang’s branch …. Not good though, maybe QC not there during busy hours. The noodles were lumpy and the chili too hot, almost scorching.